You like a short moving average when examining a trading chart because that average responds quickly to new conditions, and you like a long moving average because it reduces errors. So why not use both of them? Or three — a short-, medium-, and long-term moving average? You can. Read on! You can look for a shorter moving average (say 5 days) to cross a longer moving average (say 20 days). When you use 5 and 20 days, you chart a one-week moving average against a one-month moving average. When the shorter moving average crosses the longer moving average on the upside, you buy. When the shorter moving average crosses the longer moving average on the downside, you sell. 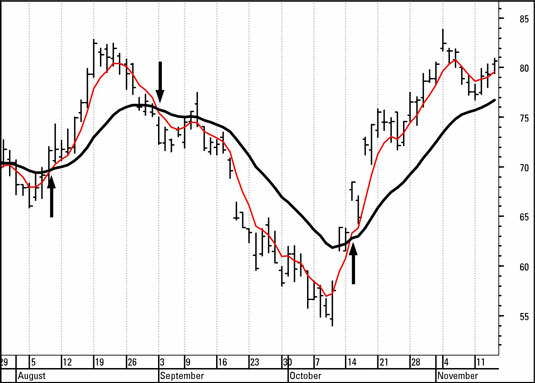 This figure shows a security chart with two moving averages, the short one at 5 days and the longer one at 20 days. You buy when the short-term moving averages crosses above the long-term moving average and sell when it crosses below. The arrows mark the buy/sell crossovers. The more open space — daylight — you see between two moving averages, the more confident you can be that the signal is correct and will continue. When the two moving averages converge (like they do near the outlier, for example), you have less confidence that the signal is going to last. If you trade the two moving average model, your gain is $25.31 on an initial capital stake of $70.61, or 36 percent, as shown in this table. You can see the crossover and don’t have to calculate the numerical value of the moving average every day, which is a nuisance. You still may want to add a filter, such as waiting a day or two after the crossover to put on the trade or qualifying the crossover by a percentage amount. The two moving average crossover is more reliable than the single moving average in that it’s less sensitive. It lags more but is wrong less often. You’re swapping risk for return, as usual. You have fewer trades than in a single moving average calculation and therefore lower brokerage expense. If two moving averages are good, three must be better. 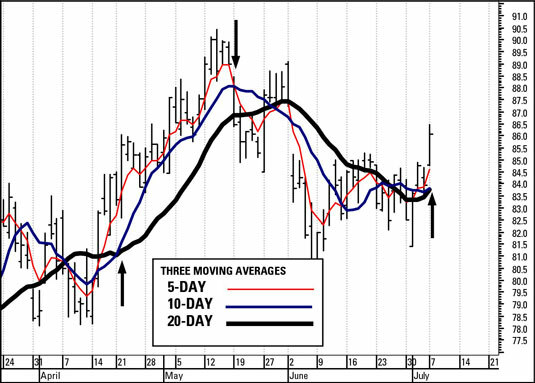 For example, you could plot the 5-day, 10-day, and 20-day moving averages on a chart, and you would consider a buy/sell signal to be confirmed only when both the 5-day and the 10-day cross the 20-day moving average. If you’re always a buyer and never a short-seller, you can add a qualification that a sell signal occurs when the 5-day moving average crosses either of the other two moving averages. This approach is the belt-and-suspenders school of trading, where you’re willing to accept a lot of delay in entering a new trade in exchange for hardly any wrong signals. The three moving average model has one very useful feature — it keeps you out of a trade if the price movement stops trending and starts going sideways, or if it becomes very choppy and volatile, so that you would need an exceptionally long moving average just to see the trend. The first arrow (on the left): Marks where the short-term moving average rises above the medium- and long-term moving averages. The center arrow: Marks where the short-term moving average crosses below the medium-term moving average — and you’re out. If you had entered short, you would have been whipsawed several times over the next few weeks. Look at how choppy the prices became, up and down by large amounts over a short period of time. The third arrow (on the right): Finally, near the end of the chart, the short-term moving average crosses above both of the other moving averages, and you get a buy signal.